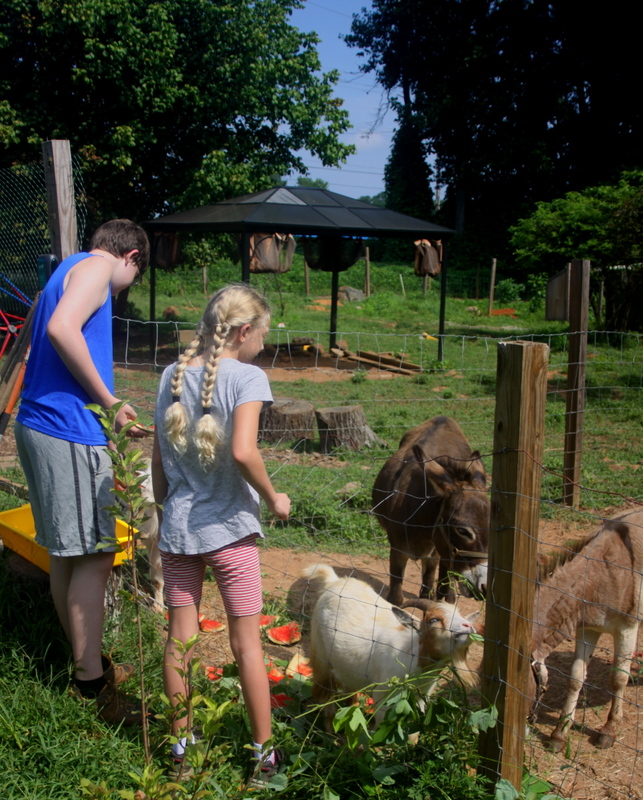 From the creeks that run through our school campus to the wetlands and beaver marsh, from the meadow to the pond, and from the trails that we’ve blazed to the shelters that we’ve built, our HomeSchool students explore every inch of our property. The HomeSchool program at The Garden School is the perfect complement to the lessons that you teach at home. We meet for the full day on Tuesdays and Thursdays. 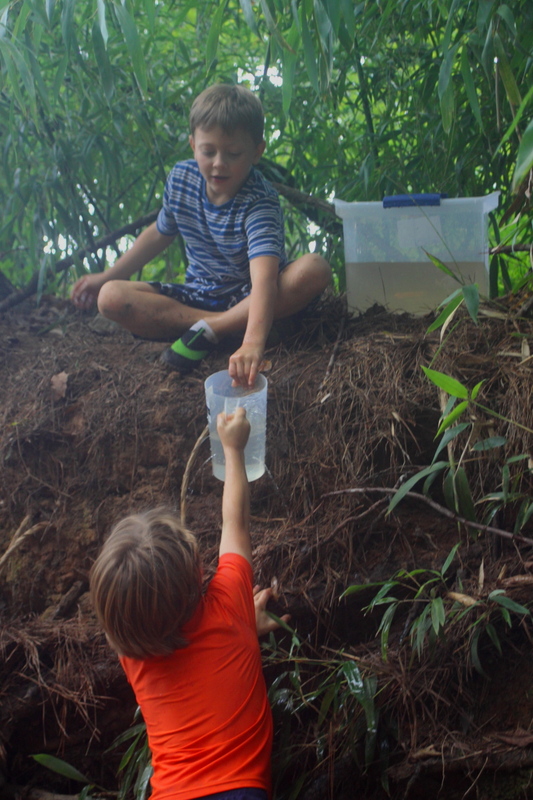 We are outdoors much of the morning, focusing on science and art, and engaging in environmental education activities from well-known guides like Project Learning Tree, Project WILD, and Project Wet. We have lunch and free play (Creekcess) on the creek bank. We are involved in projects like clearing of invasive plants, gardening, making bird feeders, or fairy house building. Indoors, in the HomeSchool classroom called the Blue Sky Room, we create poetry as a class, write in our nature journals, or build boats for our creek out of drinking straws. We create art using watercolors, stick and block crayons, chalks, bee’s wax, and modeling clay. Each week we have some sort of water exploration with a Creek Crawl, Pond Prowl, or Wetland Walk. 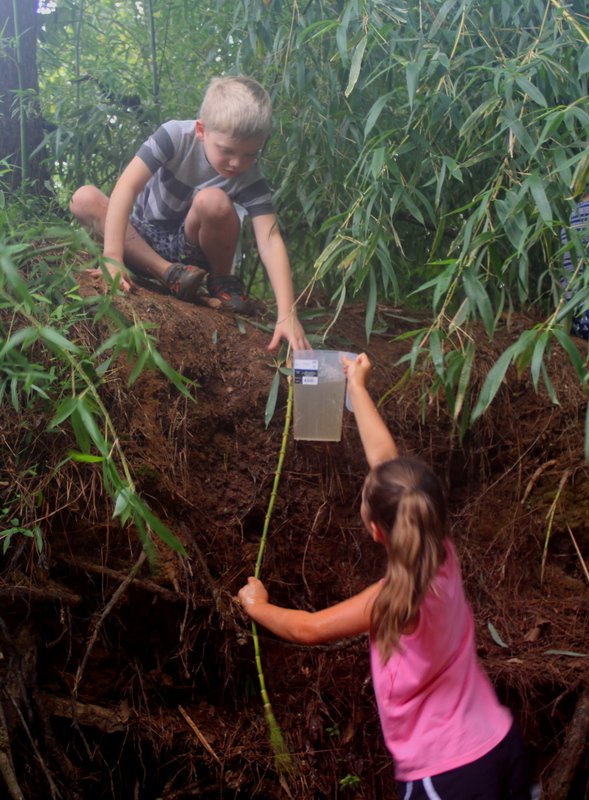 Many activities are student-directed as they decide how to build a bridge across the creek, how to cut a new trail through the pine forest, or what herbs to plant in the spiral garden. Without realizing it, they learn about other cultures, science careers, measurements, environmental issues, public speaking, and problem solving as they become more comfortable and skilled in the outdoors. The school year is divided into six seasons and the six over-reaching themes of insects, amphibians, reptiles, fish, birds, and mammals. Each season includes a take-home project that students are given two weeks to complete. We are also involved in citizen science and community service through water quality monitoring of our creek, creek cleanups, frog monitoring, visits to a dog rescue center, and storm drain marking in our neighborhoods. In addition to the environmental education and nature exploration block, HomeSchool students merge with their age groups on Tuesday and Thursday afternoons. During this time they attend special lessons, including Spanish, fine arts, math, engineering, yoga, handwork, Friendship, and games. The total cost for this annual program is $4,100, meeting twice a week on Tuesdays and Thursdays following our school calendar. There is an annual supply fee of $500. You can read more about tuition and fees here and read about our application process here. One of the best ways to learn about us and our programs here at The Garden School would be to attend a guided tour or open house.